This was our first cruise with Royal Caribbean and the Explorer of the Seas. Our 10 day cruise left from Cape Liberty in northern New Jersey. At the Cape Liberty terminal we were quickly taken care of and then shuttled by bus to the ship. The reverse disembarking process was just as swift. We boarded in time to enjoy lunch at the Windjammer Café. The Explorer of the Seas would sail with 3,068 passengers. Navigating the ship wasn’t much different than our previous experience on the Golden Princess. When using the elevators, grab the first available elevator no matter which direction it is going. At meal times, they are most often filled going in the direction of the dining rooms. Our room was compact but a little larger than most to accommodate the wheelchair. I was very surprised that there were no dressers. Our stateroom attendant did a bang up job the whole trip. We were located by the aft elevators where I could detect the vibration from the engines when lying in bed. The decks of the ship were very spacious and well maintained. I had no difficulty pushing my wife in her wheelchair. There were no curbs or lips to negotiate. Activities were varied and well planned. I most enjoyed the bingo games after I had won $132. The cruise director did a great job at all of the variety shows. The singers and dancers were delightful as well as the Ice Skaters. We also attended the adult Quest game which came highly recommended. Our first port was Sydney, Nova Scotia. 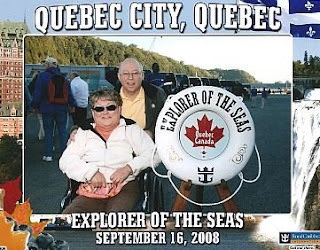 An accessible ride to the Alexander Bell Museum in Baddeck was arranged as a private tour. In hindsight, I would recommend the “Spirit Of The Fiddle” held at the terminal dock. The area is completely accessible as is the small shopping area. If you are into scenery, the Bell museum is a 45 mile scenic drive. The Bell complex houses the most extensive collection of Bell artifacts in the world. There is a family bathroom located on the second floor. All floors are accessed by gradual ascending or descending ramps. Our second port was Charlottetown, PEI. We used a private tour company called Pat and the Elephant. We covered most of the island in the four hour tour. The town is small and scenic. The countryside was flat with well manicured farms. Our third location was cruising on the Saguenay River about 5:00 P.M. If you attend the early seating for dinner, you will be limited on your viewing of the picturesque country. Quebec City, our third docked port was viewed for an accessible motor coach. This guided 3 ½ hour tour covers just about everything there is to see. However, wheelchair visitors may not leave the bus in the old city as there are not level places where they can safely operate the lift. Ambulatory people may walk around the Old City area for about 45 minutes. Our last port was Halifax, Nova Scotia. Our tour was arranged through RCCL. It was conducted by a Greyline guide. The vehicle was a local handicapped ramped taxi. We visited the Maritime Museum, drove around the city view the Citadel and Victorian Gardens. Our guest blogger is Marty Boroff. Marty enjoys cruising with his bride of 42 years, Ina. They live in a suburb of Chicago with their daughter and four Siamese cats. Thanks, Marty!